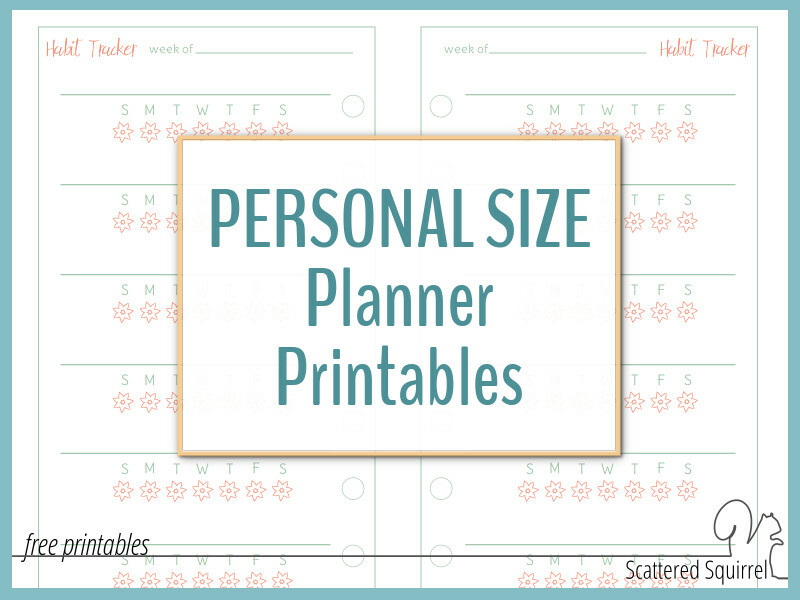 New Personal Size Planner Printables are Here. I’ve been working on a secret little project that I’ve been dying to share with you all – actually, I’ve been working away on a number of different projects that have kept me hopping behind the scenes. Today I’m sharing one of those secret projects with you, and I think some of you will really like it. Are you ready to get personal? Well scroll on down and check out the newest size addition to the printable library – personal size planner printables. For those of you who have been following me for a while, this might sound a little weird because you know I’ve never been a fan of the personal size planner. I found them too small to fit my needs. 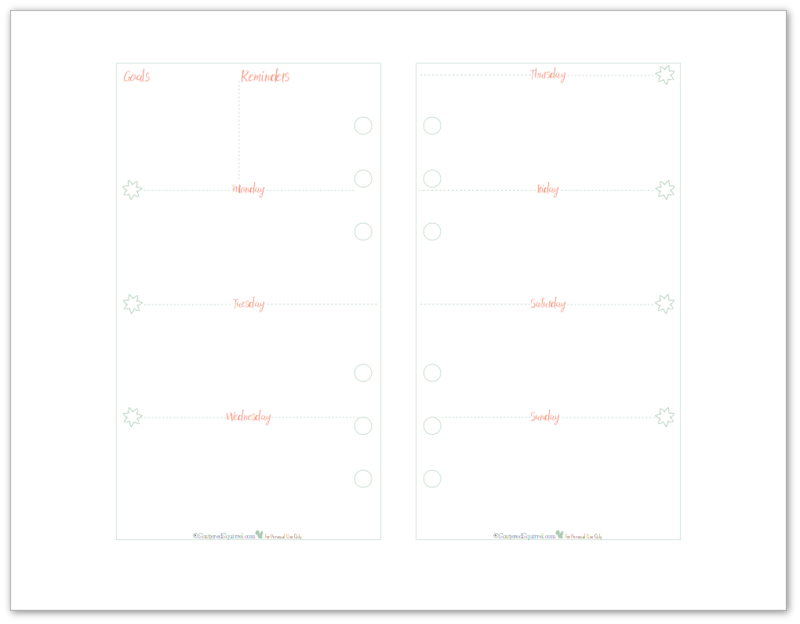 But, last year I start receiving more and more requests for personal size planner printables and the more I thought about it the more I really wanted to try my hand at them and see what I could come up with. So, I bought myself a personal size planner and decided to play around with it for a few weeks to get a really good feel for the size and various functions it could serve. Low and behold I fell in love with the size and portability. It really was perfect for personal planning. I’ve only created three printable for it so far, but that’s a good number to kick off this collection with right? I didn’t want to wait any longer, and so without any further adieu – here they are. I’m using my personal size planner as well, a personal planner. 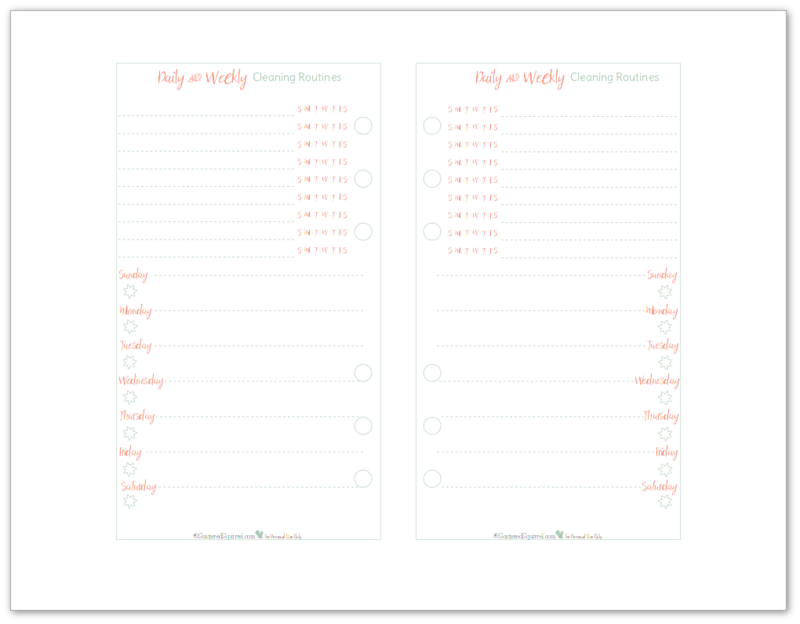 It’s where I’m keeping track of routines I currently have or am working on, personal goals, my own weekly items and appointments, things like that, so the first three printables cater to those needs. First up is the weekly spread. I’ve been using the inserts that came with my planner because they’re convenient and there, but I really wanted one that was my own. I’m loving the lighter colours right now, so I opted to go with a coral and mint colour scheme. Now, I know that lighter colours don’t always print well in black and white, and I know that there are many people out there who prefer to print in black and white, so I actually made two different copies of the same layout. I’m really trying hard to build good routines and healthy habits this year, so the second printable I made was a weekly habit tracker. This allows me to work on a few things at a time while tracking whether or not I completed them each day. Again, I made this one in two colours. And last but not least I included a daily and weekly housecleaning schedule. At first, I wasn’t sure I needed this one in my planner, but I’ve been surprised at how helpful it’s been when it comes to making sure I’m staying on top of things. I left it blank on purpose so I can tweak things and change things up as needed. They boys are both entering new phases of life right now so some of our routines need to change to accommodate that. These are important if you want the pages to be the right size. When you go to print, check your printer settings. Make sure page orientation is set to landscape. Find where your printer margin settings are and turn them all to zero. Otherwise, they’ll print smaller than they should be. As always, to snag a copy of the printables for yourself, simply click the pic of the ones you want. I’m still kind of surprised by how much I’m enjoying using a personal size planner, but it’s kind of nice to have one that it’s just for me. Sometimes it feels more like a journal than a planner. I’ve even started using washi tape and sticker to decorate the pages a bit – if you follow on Instagram you’ve probably noticed that. Once things calm down a little I’m thinking of doing a video walk through of my planner and how I’m using it. What do you think? Is that something you’d be up to watching? 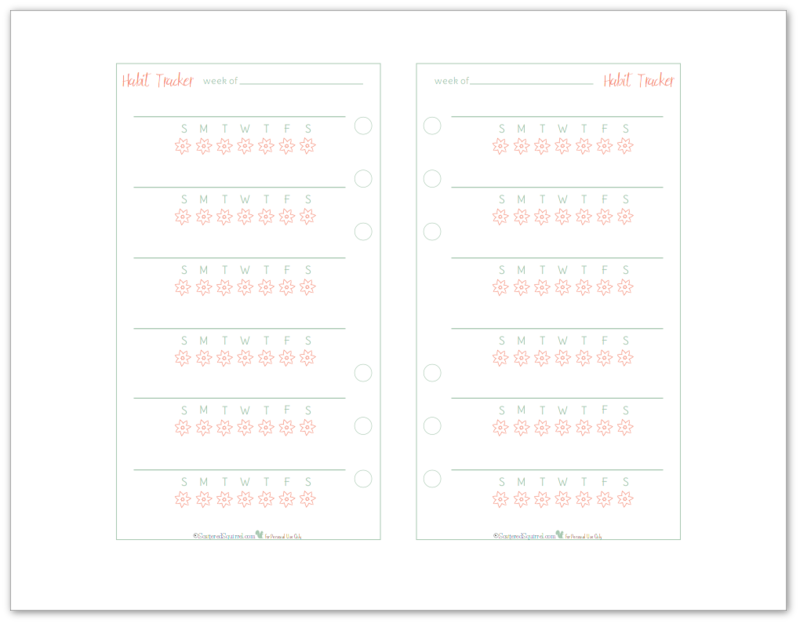 I’d love to hear what you think about the new personal size planner printables. Do you use a personal size planner? Are there other planner printables you would like to see in this size? Let me know in the comments below. You’re very welcome Sandra. I have a few more in the works, but I’m still fine tuning the layouts. Which personal size planner are you going to be using? You are wonderful to share these beautiful templates! Thank you! Thanks Nancy. 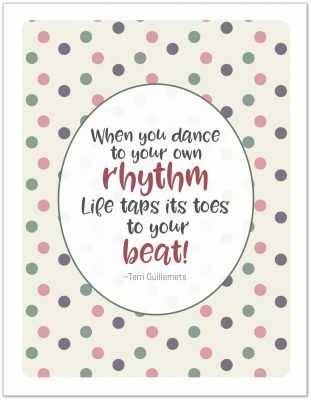 I hope you find some printables to that will work for you. Yay! I’m excited! I will be trying out the habits tracker first since my personal size already has a weekly. I would love to see a book list one (name, author, date started, date finished). I have book suggestions I find all over the place. Having it in a personal planner would be great so I could refer to it while perusing Barnes & Noble or the library. Maybe even have a check box for “already own” or something too. Thanks so much! Hi Monica, thank you so much. I’ll add book list printable to my list of ones to make, I think that’s a great idea. I love the “Already Own” checkbox idea. That would come in really handy. I’ve been hearing some wonderful things about the Recollection planners, but haven’t yet had a chance to check them out for myself. 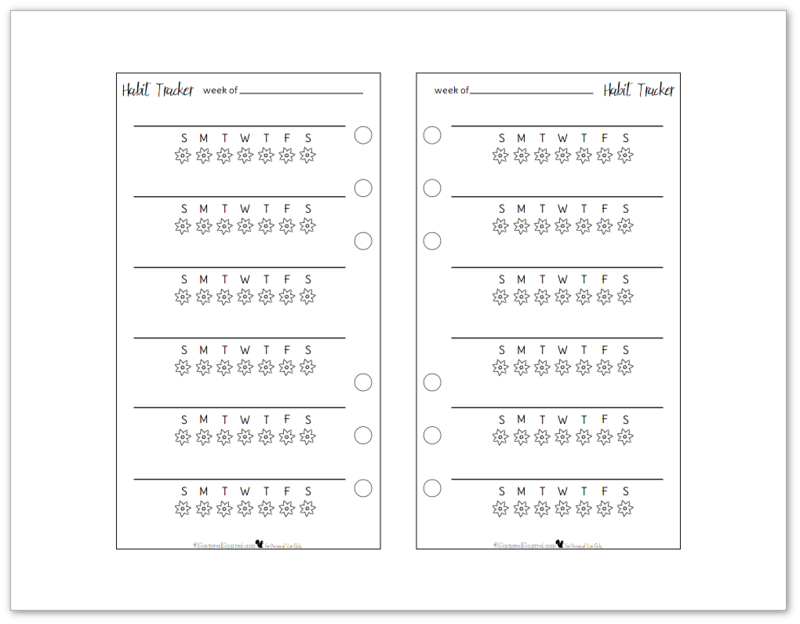 I’m glad that you’ll be able to use some of these printables to set up your planner. I have more personal size printables coming. Hi, how are you? I would like to thank you. Always I wanted to have a planner and thank you will get . I am Brazilian and here , the planner are very expensive , so I can not have one, entede ? But I’m a little confused in the way that works sizes. Can you help me? I’m happy to help out with the sizes. I currently have 3 sizes of printables here on the blog. Personal = 9.6cm x 17.2 cm (3.75 x 6.75 inches) these are also designed two pages per US Letter page and require you trim them down to size. I would really like to download these for my personal size planner, but it is not working. So I was wondering if you have them anywhere else or in a different format? Hi Elisabeth, when you click on the picture of the one you want it should open the PDF in your window or ask you if you want to save. Is it not doing that for you? Which ones were wanting? And is is all right with you if I email them to you? Thank-you so much! I have downloaded and printed the weekly spread, and it’s so cute, and will work perfectly in my recollections planner. That’s awesome to hear Karyn. I hope it works well for you. Thank you for these! Do you possibly have these same inserts in maybe an A5 or pocket size? 🙂 How did you make the outline of this and add holes? I have some half-size horizontal weekly ones that look similar but that’s it for now. Which ones are you looking for? I’m working on pocket size printables now but they won’t be ready for another month or two. I use a program called InkScape to design all my printables. I just added the holes into the design by measuring an existing personal size planner page to get the right dimensions and spacing.